This was a somewhat unusual series. During the 90's, when sitcoms were about to take over entirely, but before reality television had taken root, this series appeared. 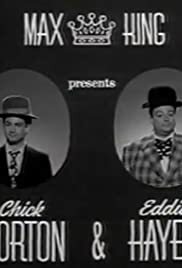 It was a modern black and white series that was done in the style of films, like Laurel and Hardy & Abbott and Costello. I have not seen this series in years, but it did provide some chuckles. It was generally pretty good, as I remember it, but there were aspects that I felt could have been better. There were times, where I felt that the representation was a bit over-simplified. Many of the elements were there. Singing, stock footage, slapstick, simulated low budget effects, etc. These were combined with plots and acting that were a bit too stereotypical, in my opinion -- along with some modern computer effects that reminded you that it wasn't really vintage. Occasionally, I felt they over-did certain aspects, like repeated footage of a woman being chased against a scrolling background. While this did seem clever, they repeated it so many times, it got annoying -- more than was necessary to get the point across. Even so, I know I'm being picky. I just felt that it could have been even better, if they had tweaked it a bit. Here's a little bit of insight, that could explain why this series was so short, and why it was "cancelled" after only six episodes. It might also explain the format, and why more effort wasn't put into it. When this show was broadcast, it was shown as a companion to Police Squad!, which was another very short series that was only six episodes long. Together, the shows filled out an entire hour. 30 minutes seems short for an Abbott and Costello type show, but it seemed fine, when paired with Police Squad. Police Squad was a parody police series from the 70's. It was a brilliant, but short series. It was one of the few shows, when I was a kid, that made me laugh until I couldn't breathe. I suspect that Morton and Hayes was only created to compliment the re-showing of Police Squad!, and it was never intended to be any more than that. I think they even repeated it about 1 1/2 times, before the run was over.